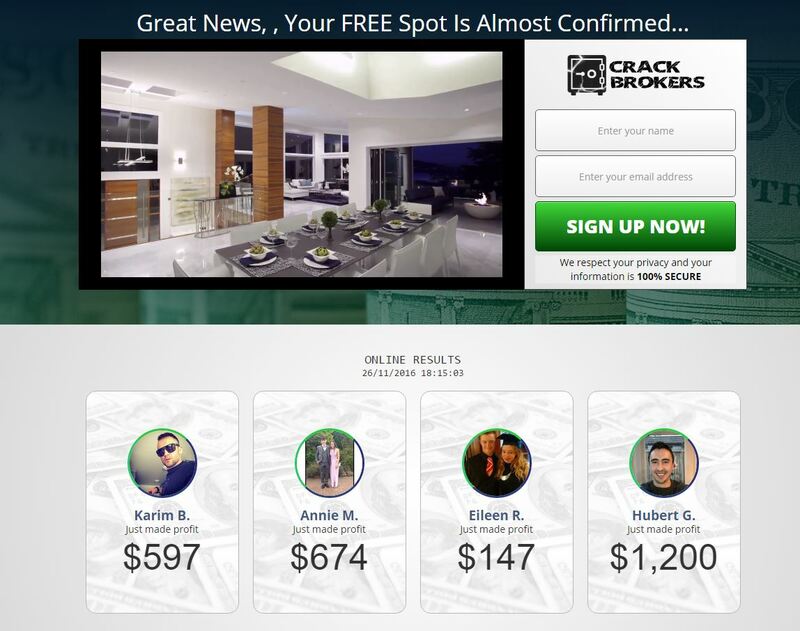 In this review of Crack Brokers we prove that it is is a scam. It is presented by Thomas Mallon. 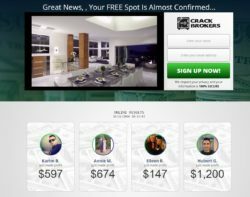 Crack Brokers is a binary options trading software that is allegedly earning $2,500 per day, $17,500 per week or $70,000 per month. And because it is easy to get rich nowadays, Crack Brokers is of course free. In reality Crack Brokers is of course a scam. It is designed to take your money and lose it in bad binary options trades, because scammers cannot trade profitably. Mallon is a fictitious character played by an actor. In fact this guy is a professional scam artist that played the main role in several scams. Look at the picture to see some examples, we’ve seen him for example in Wall Street Trading Software, Cashimprove or High Frequency Trader. Every time he used a different name, but he always is promising free money in different programs that in reality lose money. On the Crack Brokers website you can see some alleged real time trading results of users of this program. But they are all fake and it is easy to prove. Look at the picture, it shows allegedly live trading results with a Saturday evening date. And this is impossible, because markets are closed on weekends, so these results are fake. And what about testimonials shown in the video? Fake, of course. Made with paid actors. We also had a look at the Crack Brokers software to see what scammers used this time. It is a well-known app used by many other binary options scams. Look at the picture to see a few examples, this same exact app is used for example by Satellite Trader or Obcasio. 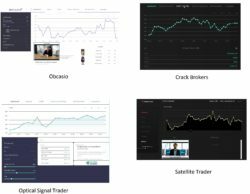 This software loses money in real trading, we know it from real users! So how does Crack Brokers work? People who are behind it get paid by a certain broker for referring new depositing clients. That’s all. So they won’t let you to try their app until you deposit money with their broker. Because they need to get their affiliate commission first, only then you can discover that their software loses money. 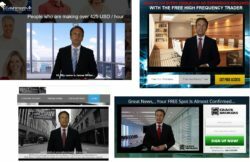 Crack Brokers is a dirty scam that will push you to deposit money and then it will lose it, because it cannot trade profitably. You can learn how to trade profitably on a free demo account with a regulated broker. That’s the real way to make money with binary options. Start trading with real money only when you are consistently profitable on the demo. Thank you for your review and info about Crack Broker. Now I wonder how and where i can safely and effectively learn the ropes to trade binary options for free, with some genuine live video tutorials, manuals and a demo account linked with real FX fanancial datas for practising until I feel confident enough to trade with real money but on the lowest scale possible. I live in Brussles (Belgium) and would like to start my learning journey with a reputable trustworthy broker both regulated by the EU and SEC autorities, to be on the safe side. Thank you for your time, keep up the good work tracking all the scammmers and con artists out there in cyberspace.